The Confederate Flag: What does it stand for? What we value most: God, country, family, or self? By Kent Lenci in Uncategorized on March 5, 2015 . Part of our dialog with BGA has been about our perceptions of the “other”– how we think about southerners and how they think about northerners. When we started this conversation, we each had some unflattering ideas about the other (northerners as “rude” and southerners as “racist” and “hillbillies”). Our conversation seemed to challenge those ideas, but it’s time to revisit the issue. Now that we are studying the Civil Rights Movement, how do our studies– the viewing of photos such as the one below, video footage of events in Little Rock, and the reading of Warriors Don’t Cry— affect your perception of southerners? I don’t think my perception of the south has changed from our studies, but my perception of the south when integration was happening has changed. From the books and videos that we have read and seen, I have seen many examples of racist actions that happened in the time of integration. I don’t associate these events with the south that exists now, and I don’t think southerners are racist now like they were back then. It doesn’t affect my perspective of southerners now, but it does affect my view of southerners in the past. So many southerners were acting awful to these children who just want a good education. I know that not all southerners were racist but many were. I have a question for BGA kids, have you guys learned anything negative about the north’s past yet this year? I think that northerners and southerners are now pretty much the same. Back to when there was segregation the south was way more racist. I think that my perception has definitely changed. Now I do think that all along, the south does have more racist people then the north. Now a days, I do think that the north does have quite a few racist people, but after seeing videos and pictures of the South and reading ”Warriors Don’t Cry”, and seeing riots (etc). It has lead me to think that the south still does have a lot of racism. The book Warriors Don’t Cry changes my perspective a little because even if most people in the south aren’t racist, some definitely were racist. The kids just wanted to go to a god school and almost everyone treated them like animals. Calling them the N-word and spraying them with acid and even physically harming them. So in the past I can confidently say that there was racism in the South. My perception of Southerners as changed. One tipping point was what Governor Faubus misuse of power when the Little Rock Nine were integrating to central. 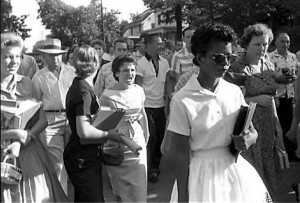 This was when Governor Faubus put the National Guard to not allow the Little Rock Nine into the school. This was after direct orders from President Eisenhower to use the National Guard to aid the children to enter the school. Reading the book Warriors don’t cry honestly doesn’t really change a lot because this book was written about a time in the 1957 and it is 2015. A lot of people aren’t as racist as they were a while ago. Yes, there is still some racist people, but back then almost every white person in the South was racist. Yes it changed my opinion on southerners in 1957 because I really didn’t know much but my opinion didn’t really change when your talking about 2015. After reading the book and learning about the Civil Rights Movement, I belive that most of these racist comments were only made to insult African Americans. For example in Warriors Don’t Cry, only some of the people were insulting the Little Rock Nine. 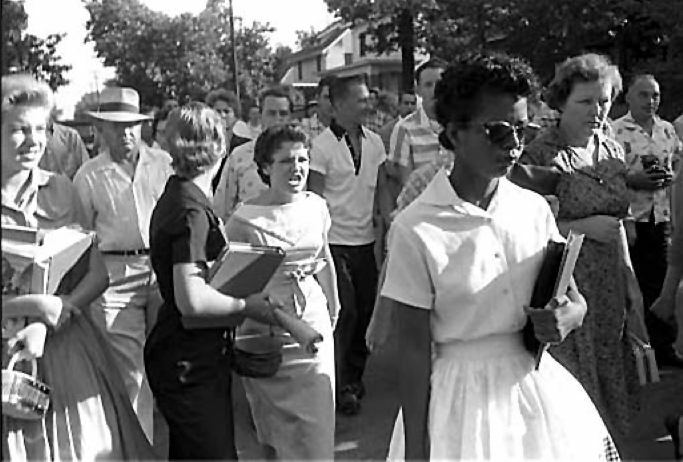 Some white people that were nice to the Little Rock Nine were Mrs. Pickwick and Danny. I think it is possible that even though we had changed our minds about how we see southerners we have been exposed in “Warriors don’t cry” to enought negative situations and violence to change our negatively to what we might have seen earlier. To add on to Charlie Mehm I want to know if you guys learned anything out of school about the northerners that seemed bad? I don’t think that my perception of the south has changed. Even after reading this book and watching all these videos I don’t think all southerns are racist and rude as the book and the videos show. Also these videos were taken and this book was based in the 1950’s so i think that we have all changed even though there is still some bias to race. My perspective of the South has not changed. I still think that some Southerners are racist. The way I see southerners has changed tremendously in a positive way. They’re some southerners that are bad and some that aren’t. I used to think of southerners as racist hillbillies, but after talking about it in class I can now see not all southerners are bad. Welcome, BGA, Advent, and Brookwood Students!